New book DO ANYTHING out January 1st 2016… but here’s how you can get it THIS WEEK! 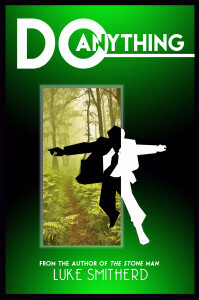 My new novella, DO ANYTHING, is out on and is available for pre-order now on Amazon HERE … but how would like to get your grubby mitts on it THIS week? Ok. Before we go any further forward, click on this link HERE to pre-order and read the blurb (YOU STILL NEED TO PRE-ORDER TO GET IT EARLY!) and then come back here to find out how you get a pre-release copy. AMAZON PRE-ORDER LINK, CLICK ON THIS TEXT TO PRE-ORDER! Ok, welcome back. Now, that might enough for you. And that’s cool, I hope you enjoy the book when it comes out. However … having to wait until January 1st … do you REALLY wanna do that …? Well, here’s how you can get it within the next 7 DAYS! 1. You pre-order the book using the link above. 2. You click on this link: REVIEW GROUP SIGN UP to sign up for the group, obviously. What that means is I, personally, will send you a copy of DO ANYTHING by the end of this week. This means hopefully that it creates a win/win system; you guys get the book early, and I get reviews from day one. What do you think? Let me know.